An exciting material contrast of shimmering gloss qualities to matt surfaces characterizes the rock styles with wild leo patterns, message motifs and military influences. Wild thing! The majestic lion is joined by fierce leopard prints, typographical message patterns and subtle military influences. Suspense comes from contrasting shimmering sheen qualities and matte surfaces, which is typical for the rocker-inspired styles. Glossy velvet, metallic coatings, Lurex effects and sequins are mixed or paired with denim, resulting in exciting looks. The pleated skirt with metallic coating, the golden floral jacquard and the gold-coated camouflage jeans are particularly expressive. 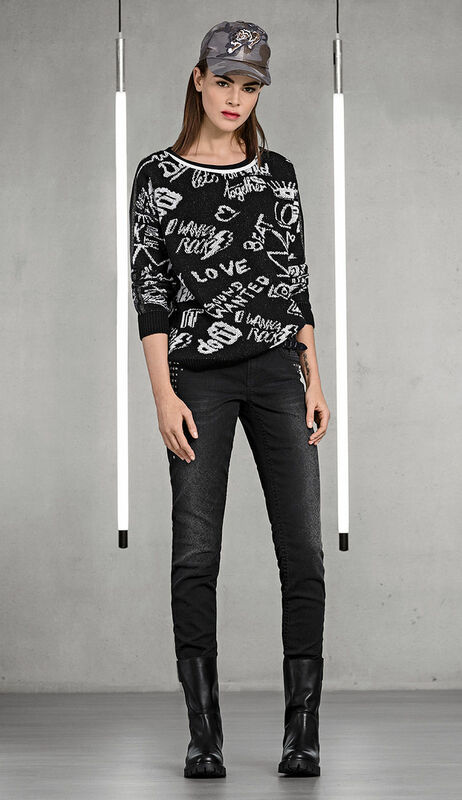 Slogans embellish bleached denim and are featured as a jacquard on sweaters and dresses. Lion appliqués roam on jackets and denim skirts. 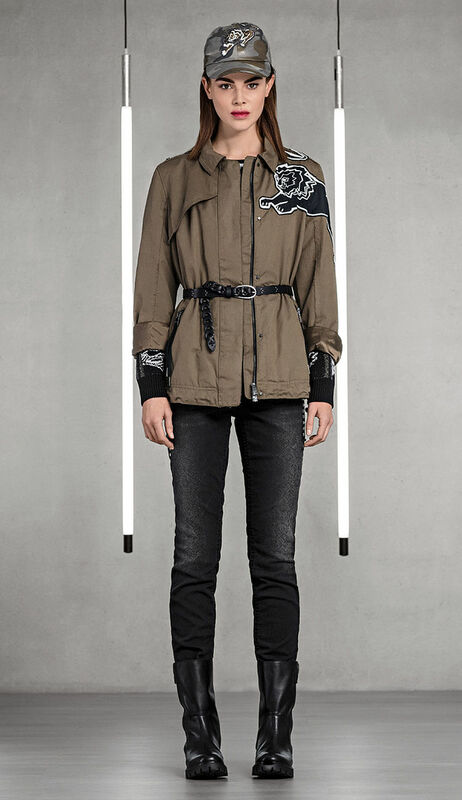 The denim jacket with a prowling lion appliqué on the back is a special highlight. Studs and iron-on decorative stones add luxurious details. They decorate the outer sides of pants and form a lion design on sweatshirts and godet skirts. Cross-body bags with rounded studs, studd- ed belts and striped ribbons further upgrade the looks.